List of programs under ACGME probation used. Fifty six programs were listed, they were sorted based on state and then on speciality. Graduate symbol map was made on an overlay of map of US (from 50states.com). NY, NJ, PA, IL, LA, TX and CA were the states with maximum programs on probation. 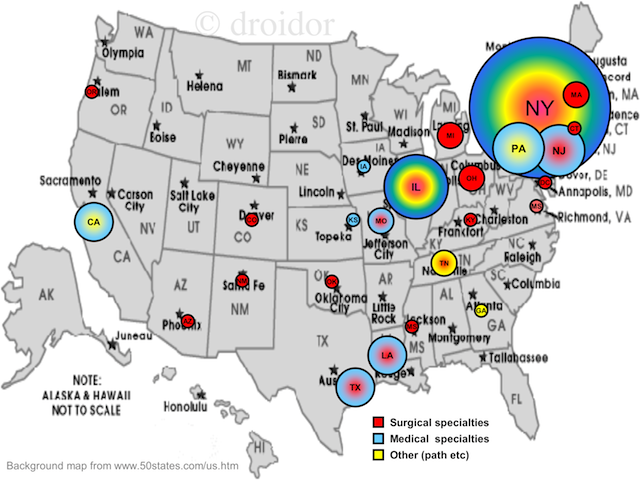 Illinois and New York had a mix of all specialities while other had combination of two branches (either medicine and surgery or surgery and other etc). Majority of programs interspersed all over the country (single program probations) were in the surgical branches as evidenced by red in places other than those discussed above. While making rank order list, it is important to take all factors into consideration. An important aspect of any program is its accreditation status. This is conferred by the ACGME when a program meet its requirements for educational, professional and work related obligations towards the residents. Programs that fail to satisfy core criteria fall under a probationary status where the program is given time to rectify its weaknesses. If the program does not fix its flaws by the next site visit, the program loses its accreditation and this is huge loss for the institution as it will no longer be eligible for benefits from state or federal sources. The data was arranged on the US map and the size of the symbol corresponds to the number of programs that have defaulted and are on probation in that state. All medical specialities are in blue and include internal medicine, family medicine, psychiatry, neurology and pediatrics. Surgical specialities are in red and include neurosurgery, orthopedics, surgery, thoracic surgery, hand and vascular surgery. Other specialties like pathology and radiology have been placed in para-clinical field marked yellow. Each symbol is a composite of the respective colors. The aim of this article is to alert the reader to the programs that under probation and to take these factors in consideration while choosing the programs to apply or even making the rank order list. ACGME programs on probation list is here.